Since acquiring my first telescope nearly 40 years ago, I have dreamed of capturing images of the Andromeda Galaxy (M31) and Orion’s Nebula (M42). Well, finally the day, or rather nights, came for collecting the light from these distant beauties. This post describes the location where the presented images were collected and the settings used to collect them. In addition, two observation are included. My home suffers from skies polluted with city lights, lights from a nearby high school, and of course lights from neighbors. So my search for dark skies began. Living in Utah, dark skies are within an hour or two drive, but finding a night or two free from other activities, clouds, and a bright moon is not easy. On November 9, 2018, my wife and I took our RV and telescope to the Wedge Overlook Campground in Utah. The outing and location are described on our Trailer Travels blog. This location is quite dark, our weekend was free, and there was no moon. The only challenge was the temperature which dipped well into the 20s. However, for astrophotography, this wasn’t much of a challenge. I simply framed the objects, started the exposure sequences, and went into the RV and watched movies in a warm environment; it was great. The equipment used to collect the presented images is described in my First Attempt post. 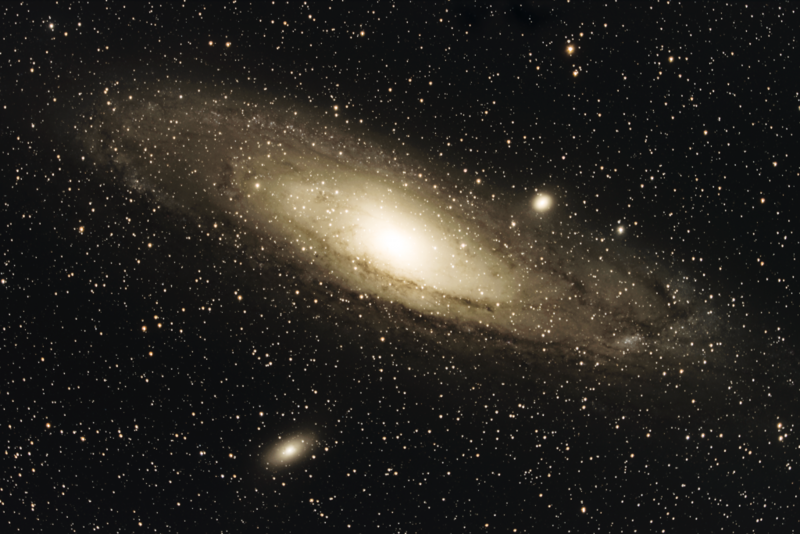 For the Andromeda Galaxy (M31) images, I collected 100 sub-exposures. Each sub was exposed for 30 seconds for a total exposure time of 50 minutes. Keep in mind that these images are shot at f/2 using the CPC 1100 and the Hyperstar system. This would be equivalent to 100 sub-exposures with exposure durations of 4 minutes each on an f/5.6 system, about 6.7 hours of total exposure time. I’d love to try many more exposures and many more exposures at shorter exposure times and compare results. However, on this outing, I tried collecting light from many objects rather than focusing on a few. I won’t repeat that mistake. Each sub-exposure was collected with a camera gain of 93 (unity gain) and an offset of 12. In addition to the sub-exposures described above, flats, darks, and bias frames were collected and processed as described in my previous post. The resulting image of the Andromeda Galaxy (M31) was processed in Adobe Camera Raw and finished with Adobe Photoshop. 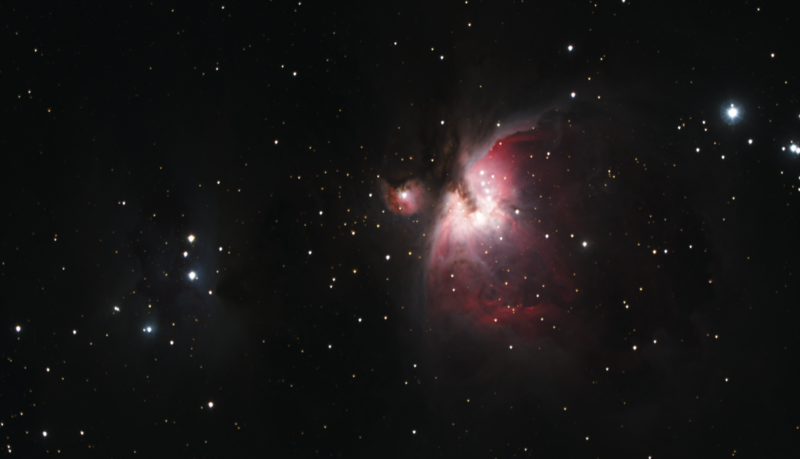 For the Orion Nebula (M42) images, I collected 10 sub-exposures of 30 seconds each and 100 sub-exposures of 5 seconds each. This is a total exposure time of 13.3 minutes. Again, keep in mind that these images are shot at f/2 and are equivalent to 10 sub-exposures of 240 seconds each plus 100 sub-exposures of 40 seconds each, for a total of 1.8 hours. As before, flats, darks, and bias frames were collected and processed as described in my First Attempt post. The result was two images of the nebula that were processed in Adobe Camera Raw and finished with Adobe Photoshop. Finally, the two images were selectively merged. The image created using the 5 second subs provided the core of the nebula and the image from the 30 second subs was used to provide the subtle nebulosity near the outer edges of the nebula. In the future I will focus my efforts on one or two objects per night and try an array of exposure times, number of subs, etc. rather than trying to acquire data for 5 or 6 objects. The time required to frame, focus, and take samples wasted a lot of time and in the end only resulted in two usable images. You may notice that the shape of the stars in the image appear a bit triangular in shape. I believe this is due to collimation error in my optical path. I have acquired a laser collimator and Hyperstar attachment and will use them to test my hypothesis and correct the problem if it exists. Hopefully my next images will be better than those presented here. This post documents my first attempts at astrophotography with the Celestron CPC 1100 GPS telescope and the Hyperstar imaging system. My first targets were Markarian’s Chain and the Pinwheel galaxy (M101). Unfortunately, the targets were captured in an environment polluted by lights from a neighboring high school and multiple street lights. The remainder of this post describes the equipment used, the process used to capture and improve them and the images captured. The main equipment used to capture Markarian’s Chain and M101 was a Celestron CPC 1100 GPS telescope, the Hyperstar 3 system and a ZWO ASI071MC Pro camera. In this configuration, the CPC 1100 becomes a 560mm focal length f/2 system. 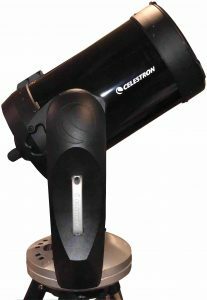 The telescope was mounted on the Celestron HD Pro Wedge which increased tracking accuracy allowing for longer exposures. The camera was connected via USB 3.0 to a laptop running Nebulosity 4 for image capture. The resulting images were processed using Photoshop. Target images contain the desired signal as well as noise from several sources: bias, thermal and optical system imperfections. Bias noise represents the electronic signature of the camera. Thermal noise becomes more evident with long exposure times and warm sensors. Optical system imperfections include vignetting and other characteristics specific to a particular optical system. Many target and calibration images are taken, processed and combined to reduce noise. This section describes the images that are captured and the processing necessary to yield results. As previously mentioned, bias noise is created by the electronics of the camera used to capture the images of interest. By capturing short exposure images with the camera’s lens cap on, they contain little noise from thermal or optical issues. These images are collected with the same camera gain used to collect target images. 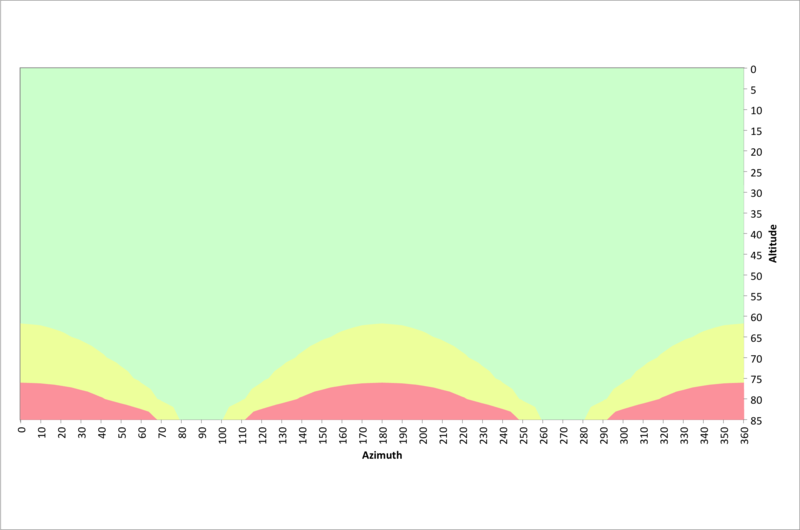 The bias frames collected are averaged to create a master bias frame. How this master bias frame is used during processing will be described shortly. It is important to point out that every frame contains bias noise regardless of exposure time or how cool the sensor is kept. Dark frames contain both bias and thermal noise. They are acquired by placing the lens cap on the camera and taking exposures equivalent to those used to acquire the target images. It is ideal to have the camera at the same temperature, use the same gain and the same exposure times that were used to capture the target sub-images. Like bias frames, these frames are averaged resulting in a master dark frame. Flat frames contain bias noise as well as artifacts of the optical system. These artifacts include vignetting, dust on lenses, mirrors and sensors, and other optical system imperfections. While there are multiple ways to collect these frames, I use the t-shirt method. I place two layers of a white t-shirt over the aperture of the telescope and take numerous exposures. The focus and orientation of the camera to the optical system are kept consistent with those used when the target images were collected. The exposure times are controlled to give reasonable exposures. The sub-exposures, or subs, are the acquired images of the target object including the described noise and imperfections. 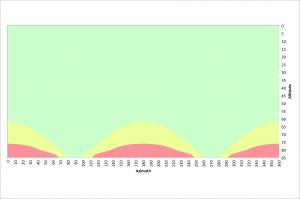 The optimum exposure time for subs is a hotly debated topic in numerous forums. Too short and the images contain too much read noise to result in good quality finished products. Too long, in areas like mine, and they are washed out from light pollution. Exposure times between 2 and 20 minutes seem common with the average being in the 3-5 minute range. Given that this f/2 system is 8-10 faster than most others, I use exposure times considerably shorter. The noise components of captured images cannot simply be subtracted resulting in a noise-free result, but the solution isn’t that much more complicated. One of the complications is that bias noise is contained in all captured frames. Let’s first consider the flats and the elimination of vignetting. Flats contain data characterizing the optical issues of a particular system as well as bias noise. We begin by subtracting the master bias frame from each flat frame. The resulting flat frames have little thermal noise because they were acquired with short exposure times and the bias noise has been subtracted. The resulting frames are averaged to create a master flat frame. The master dark frame, described above, is subtracted from each of the subs. The result is a set of images that contain target data and ideally no bias or thermal noise. Each of these frames is then divided by the master flat frame to remove the imperfections of the optical system. The result is a set of subs that ideally contain no noise or optical imperfections. These subs are then de-mosaiced, converted to a full-color image, aligned, rotated and scaled using star images and averaged. The result is a single output image file with a much higher signal to noise ratio that can be post-processed to yield good results. 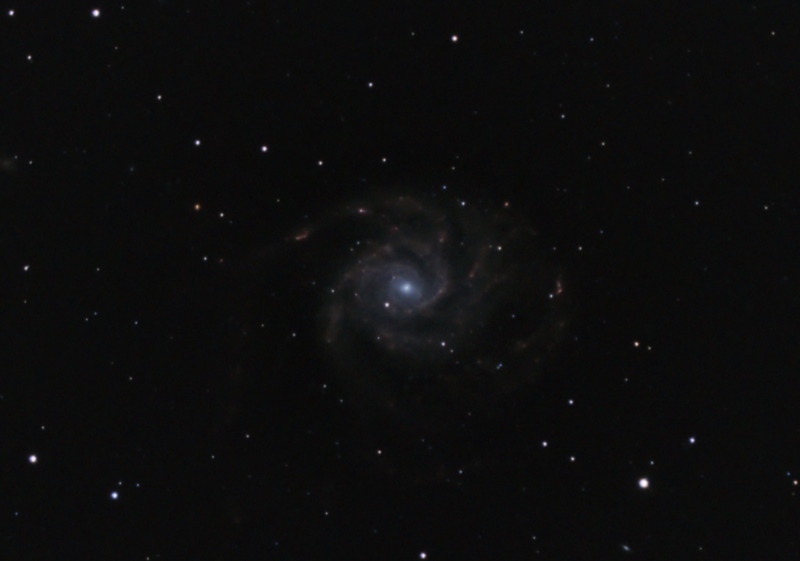 The two targets of interest were Markarian’s Chain and the Pinwheel galaxy (M101). This section describes the subs taken and shows the results after post-processing in Photoshop. The Markarian’s Chain sub-exposures were acquired using 50 second exposure times with a camera gain of 94 (unity gain). The figure to the right is one of the 110 sub-exposures. The most significant visual issue is the significant vignetting. In addition, these exposures are likely too long given the conditions. Future attempts will be made with more subs, but shorter exposure times. Bias, dark and flat frames were collected and used to process these sub-exposure frames. The result was a single pre-processed image file that represented just over 1.5 hours of total exposure time. This image was processed using Photoshop resulting in my first finished product illustrated below. The technical aspects of creating such an image are interesting to me, but in addition, I am always moved by the sheer immensity of space and the beauty of the creation. This image contains at least 10 galaxies each of which contains hundreds of millions of stars, that’s simply amazing and inspiring! The Pinwheel galaxy is located near the handle of the big dipper and was an enjoyable target to witness for the first time. Each sub-exposures was acquired with a 5 second exposure time with a camera gain of 200 and an offset of 50. The figure to the right is one of the 120 sub-exposures. The most significant visual issue is again the significant vignetting. In addition, there is significant noise due to the high gain used. In the future, I am unlikely to use gains greater than unity. 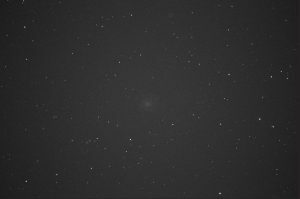 As with the Markarian’s Chain images, bias, dark and flat frames were collected and used to process the M101 sub-exposure frames. The result was a single pre-processed image file that represented 10 minutes of total exposure time. This image was processed using Photoshop resulting in the finished product illustrated below. I look forward to targetting M101 again and experimenting with longer exposure times and perhaps capturing many more sub-exposures. I am captivated by both the beauty of the universe and the technical aspects of capturing it. I can hardly wait for the next clear night and the opportunity that it will give me to capture more. I look forward to experimenting with more sub-exposures and varying exposure times. I look forward to experiencing the system in its f/7.5 configuration to increase magnification. While this will increase exposure time significantly, the challenge will be fun. Finally, I look forward to summer and fall and the new targets they’ll bring. Telescopes that slew to, and track celestial objects do so through the use of electric motors that drive their axes of rotation. Portable telescopes, like the Celestron CPC 1100 GPS, depend on either alternating current (AC) line voltage or batteries for their power. In addition, camera coolers, dew heaters and other accessories require power. The remainder of this post describes power requirements of typical astrophotography equipment and the construction of a do-it-yourself (DIY) portable power supply. This equipment and their power requirements are listed in the following table. The reported values were obtained from vendor web sites, while the measured values were observed during operation. The total required current has a maximum value of 6.42 Amperes. The remainder of this post will describe the construction of a DIY power supply to meet these needs. This section describes the construction of a portable power supply that meets the needs of my astrophotography equipment. This system must be portable and supply 12 Volts at just over 6 Amperes for 4-5 hours. We’ll first list the items needed and then dive into the simple construction. 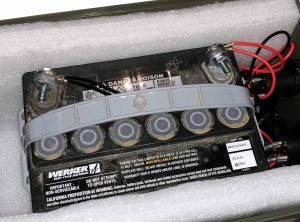 Werker WKDS12-33JUS or an equivalent battery. According to the battery manufacturer, this battery will supply 5.6 Amperes for 5 hours; this should meet our needs. Lets start with the green utility box pictured to the right. Remove the inside dividers and then drill two holes in one of the ends. These 1.25″ holes will enable the mounting of the 12 Volt receptacles and can be placed wherever you’d like them. Then install and securely tighten the receptacles in place. The next step is to make a secure location for the battery to sit in the box. 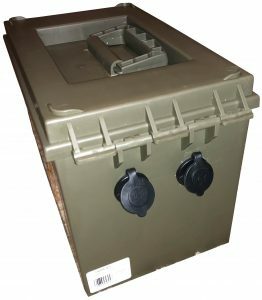 Place a 1/2″ layer of closed cell foam in the bottom of the utility box. Then add two 1″ thick blocks of foam to each end with just enough space between them to squeeze in the battery. Then add 1″ thick foam on both sides of the box to hold the battery firmly in place. In the image to the left you can easily see the indentation in the bottom of the box intended to accept the battery. 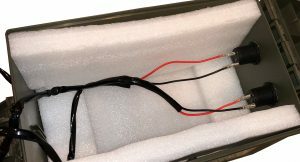 The cigarette lighter power sockets include simple wiring harnesses that enable them to be easily connected to a battery. Connect each harness to the battery with two 1″ x 1/4″ bolts with associated nuts and washers. The socket end of the harness simply plugs into the blades protruding from the power sockets. Make sure you tie the positive socket terminal to the positive side of the battery! Once this is done you simply tuck the wires neatly under the power sockets, slip the battery in place and latch the lid closed. You now have a portable source of 12 Volt power. When the battery needs recharging, you simply open the lid and charge it. In this post we outlined the need for 12 Volt power for remote astrophotography and presented a simple DIY power supply to meet the need. In a previous post we discussed depth of focus and the difficulties obtaining good focus with fast optical systems. 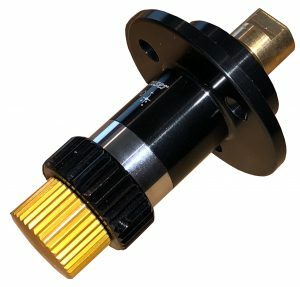 In this post we’ll discuss a solution to the problem, the Feather Touch 10:1 focuser for the Celestron CPC 1100 GPS telescope. We’ll briefly review the challenge of focusing fast telescopes and then describe how the Feather Touch 10:1 focuser will help. We’ll conclude with the installation of the focuser on a CPC 1100. In a previous post we derived three equations for depth of focus and presented a table illustrating the depth of focus for various f-numbers. This table is included below for convenience. The most important conclusion that can be drawn from this data, for the discussion at hand, is that fast telescopes, such as those operating at f/2, have very narrow depth of focus. For example, an f/10 system has a depth of focus of approximately 263 microns, while an f/2 system’s depth of focus is only about 10.5 microns. These figures are for seeing disks with a diameter equal to the diameter of the Airy disk. In great seeing conditions where the seeing disk might be 2″, these figures would increase to approximately 543 microns and 21 microns respectively. Clearly, for fast telescopes, such as those operating at f/2, the depth of focus is very narrow. These tight tolerances may make focusing these systems a challenge. As previously mentioned, at f/10 in ideal seeing, the depth of focus is 263 microns while at f/2 this is reduced by 25x, resulting in a narrow band of only 10.5 microns. However, with diminished viewing and larger seeing disks these numbers will grow. The application that spawned this investigation was astrophotography with a Celestron CPC 1100 GPS in its f/2 configuration. The question that started it all was, is the standard focuser on the CPC 1100 adequate to deal with these tight tolerances. We know how fine the focusing must be. In this section we’ll determine whether the standard focuser is up to the task or whether we need to look at other options. The focusing mechanism that comes standard with the Celestron CPC 1100 is illustrated to the right. 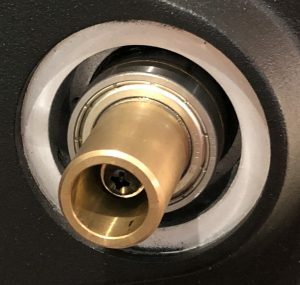 As the focus knob is rotated, the focuser either pushes or pulls a threaded rod, that is connected to the primary mirror, in or out. The rod and the focuser have a thread pitch of approximately 0.8 threads per millimeter. In other words, each rotation of the knob moves the primary mirror in or out 0.8mm, or 800 microns. In ideal seeing conditions, with this telescope in the f/10 configuration, we have a depth of focus of 263 microns. So the entire depth of focus can be traversed with just under 1/3 of a turn of the focus knob. With degraded, but great, seeing conditions where the seeing disk is 2″ in diameter, the depth of focus increases to 542 microns, or 2/3 of a turn of the focus knob. It seems reasonable to expect, and experience has demonstrated, that achieving focus with these constraints is straightforward. However, when this system is configured to operate at f/2 the depth of focus under ideal conditions is reduced to just 10.5 microns. Even with a seeing disk of 2″ the depth of focus is only 21 microns. The entire depth of focus is traversed with 1/78 and 1/38 of a turn of the focus knob respectively. These are very tight tolerances that would make achieving focus very difficult. After some investigation, I decided to try and solve the focussing problem, identified in the previous section, by acquiring and installing a Feather Touch 10:1 focuser for the CPC 1100. 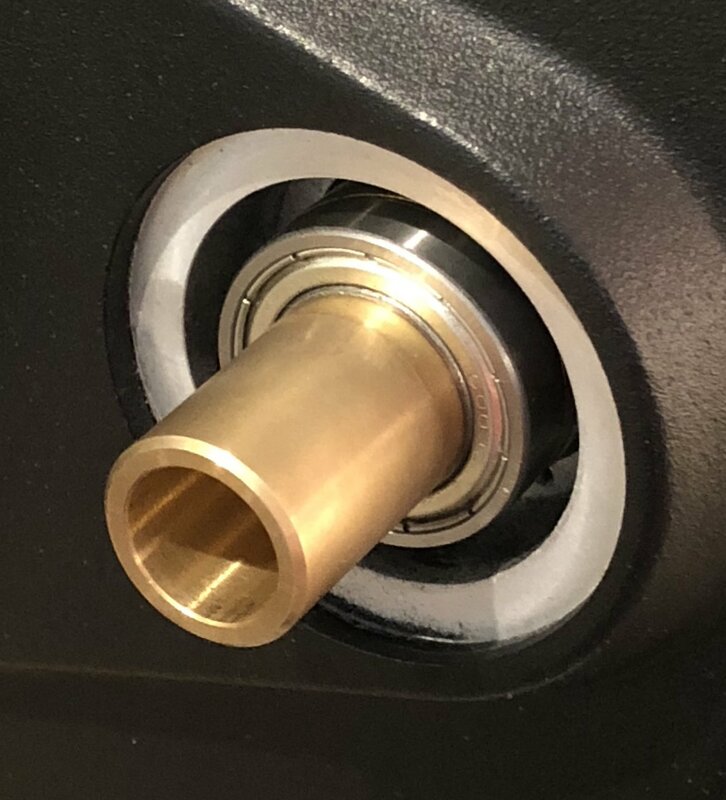 This focuser has dual speeds, a 1:1 ratio focusing knob, black in the image, and a brass colored 10:1 ratio knob. Recall from the previous section that our challenge is to focus a system with a depth of focus of 10.5 microns in ideal conditions and 21 microns in the best likely conditions. At a 1:1 ratio the entire depth of focus is traversed in 1/78 and 1/38 of a turn of the focus knob respectively. With a 10:1 ratio these tolerances increase to 1/8 and 1/4 of a turn respectively. While these are still tight tolerances, I believe focus will be obtainable. In the next section I’ll quickly walk through the installation of this focuser. It was fairly straightforward and required few tools. In this section we’ll walk through the installation of the Feather Touch 10:1 focuser for the Celestron CPC 1100 GPS telescope. There were three items in the box: the focuser, a stop and a small washer. The installation requires the reuse of four screws associated with the standard Celestron focuser. You’ll need a 1/2 inch open end wrench and a medium sized Phillips-head screwdriver. The first task is to position the CPC 1100 in a horizontal position, altitude of 0°, so the primary mirror does not move during installation. Then we turn to removing the standard focuser. After pulling the rubber knob straight off and removing the three visible screws holding the focuser to the rear of the telescope, we have something that looks like the image to the right. Hang on to the three screws as they will be used to install the new focusing mechanism. You must now rotate the brass focussing assembly clockwise until you see the head of the Phillips-head screw hidden inside. 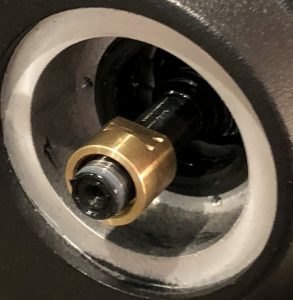 It takes quite a few turns to move the mirror back and the screw head never emerges from the hole, but does become easily accessible. When you’ve removed the screw, remove the small washer and replace it with the new washer that came with the Feather Touch focuser. Retain this screw as it will be reinstalled shortly. Now the brass assembly needs to be removed. Rotate it in a counterclockwise direction until it is detached. It takes quite a few turns to free it. 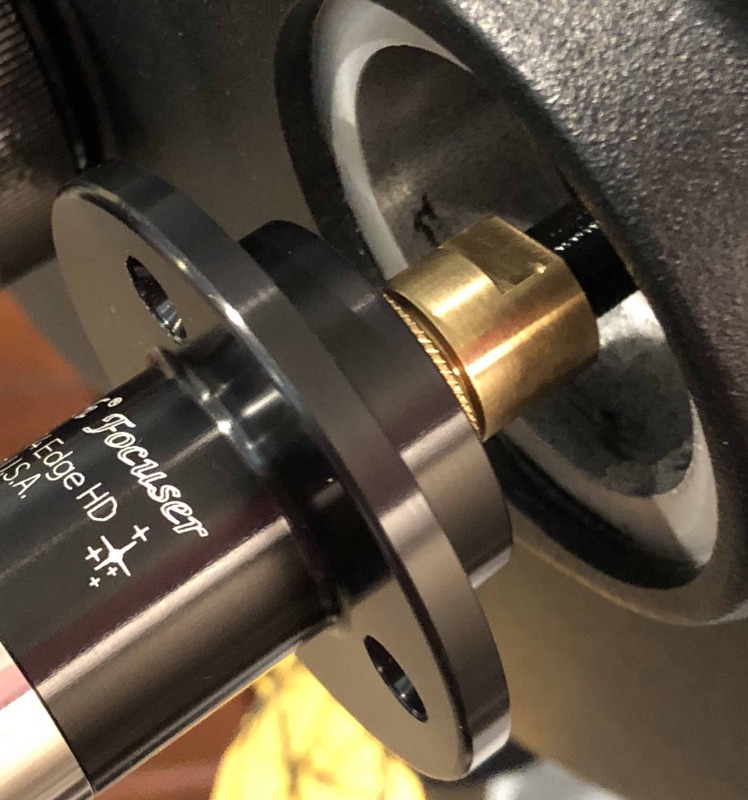 When it is removed, take the stop off of the new focuser and thread it onto the threaded shaft far enough that a few threads of the shaft are exposed. At this point it looks something like the image to the right. Now reinstall the screw, with its new washer, into the end of the threaded rod. Screw the Feather Touch focuser onto the exposed threads of the rod until it reaches the stop. Hold the stop with a 1/2 inch open end wrench and tighten the focuser against the stop. 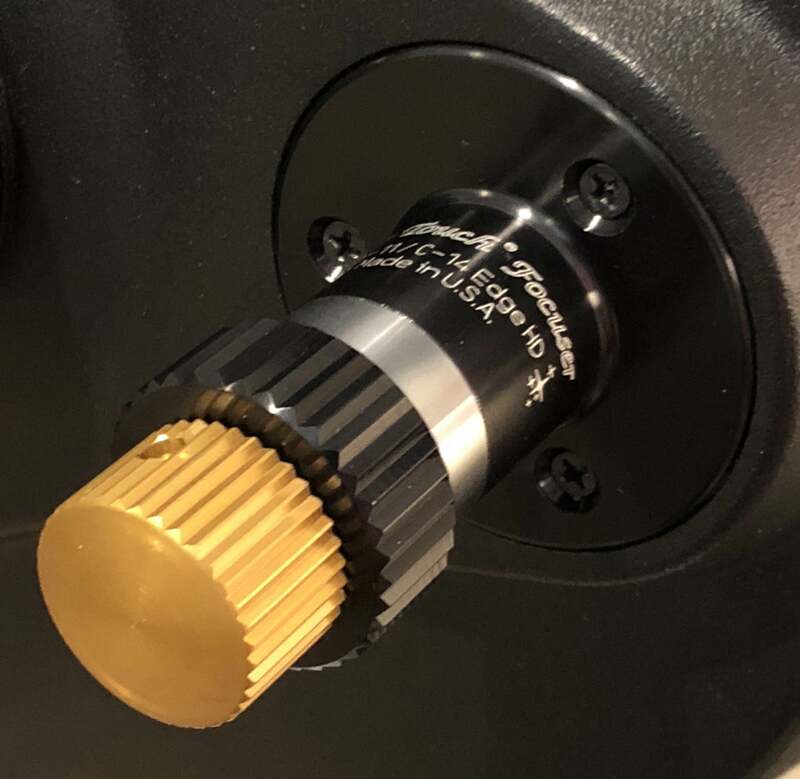 You can grasp the focuser easily by the 1:1 ratio focus knob. This must be tight! Now rotate the focuser down the rod until its mounting plate is flush against the back of the telescope. It may be necessary to push the mirror slightly forward to get the Feather Touch to seat properly. Reinstall the three screws retained earlier, and you’re done. The finished product is illustrated to the right. Now you are ready to focus normally with the black knob and with precision with the 10:1 ratio brass knob. In this document we presented the depth of focus for various f-numbers and determined that focusing fast optical systems is problematic. Finally we presented a solution and described its installation. Without diffraction and atmospheric turbulence, ideal telescopes would focus stars to points. However, there would also be a single focal point, plane or surface and everywhere else would be out of focus. Back in the real world, where diffraction, atmospheric turbulence and telescope flaws exist, stars are not imaged as points, but rather as Airy disks or seeing disks that are larger. This leads to a range where focus can be obtained. This range is called depth of focus and is the topic of this document. We’ll first describe depth of focus in more detail. Afterwards, we’ll derive it mathematically and present an approximation and a simplification based on ideal seeing. We’ll then present data for various telescope configurations and discuss challenges with focusing fast optical systems. Today’s telescopes are generally diffraction limited. This means that defects in design and construction are not the limiting factors in focusing a star to a point. The aperture of a telescope limits its ability to focus a star to a disk smaller than an Airy disk. Due to atmospheric conditions this limit is rarely achieved. Good seeing conditions result in disks as small as 2 arc-seconds (2″) in diameter. The above figure depicts light from a star entering a reflector telescope from the left and being brought to a focus at the point labelled Focus. As this cone of light converges towards focus, its cross-sectional diameter decreases until focus is reached. Beyond focus its diameter again increases. When the cross-sectional diameter is as small as the Airy disk, or the minimum size disk obtainable due to seeing conditions, there is nothing gained by it being brought closer to the point of focus. The vertical red lines indicate the region within which the image is as small as conditions permit. The length of this region is the depth of focus. 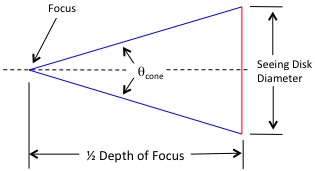 where is the depth of focus in meters, is the size of the seeing disk in meters and is the angle of the converging sides of the light cone at the focus, in degrees. The size of a seeing disk is described by the following equation. where is the seeing disk size in meters, is the angular size of the seeing disk in degrees, and Focal Length is measured in meters. By noticing that the ratio in the denominator of the above equation is approximately equal to the above equation can be simplified. where is the depth of focus in meters, is the angular size of the seeing disk in arc-seconds, Focal Length is measured in meters and f-number is the numerical f-number of the system. where is now in arc-seconds and represents the diameter of the Airy disk. where is the wavelength of light in meters being observed or imaged and f-number is the numerical f-number of the system. can be adjusted for degraded seeing by multiplying it by the ratio of the width of the seeing disk to the width of the Airy disk for the chosen aperture. The following table contains depth of focus values in microns for ideal seeing at various f-numbers using the derived equation, the approximate equation and the final equation based on ideal seeing. We’ll assume an aperture of 280mm as two of the three equations require focal length and aperture as parameters. The Airy disk diameter for an aperture of 280mm is 0.97″. There are two important conclusions that can be drawn from the data in the above table. 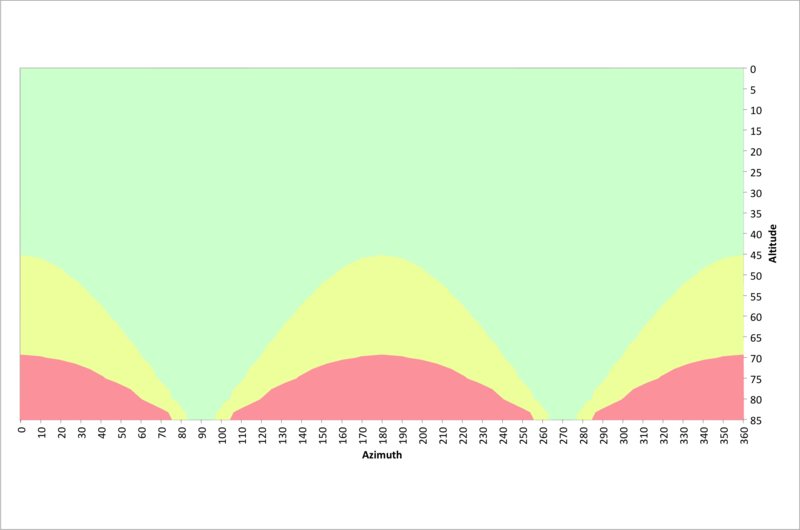 First, all three of the derived equations yield quite similar results. Second, the fact that the depth of focus is proportional to the square of the f-number is significant. This means that at f/10 the depth of focus is approximately 263 microns while at f/2 it is only about 10.5 microns. It is important to remember that these figures are for seeing disks with a diameter equal to the diameter of the Airy disk. In great seeing conditions where the seeing disk might be 2″, these figures would increase to approximately 543 microns and 21 microns respectively. For fast telescopes, such as those operating at f/2, the depth of focus is very narrow. These tight tolerances may make focusing these systems a challenge. 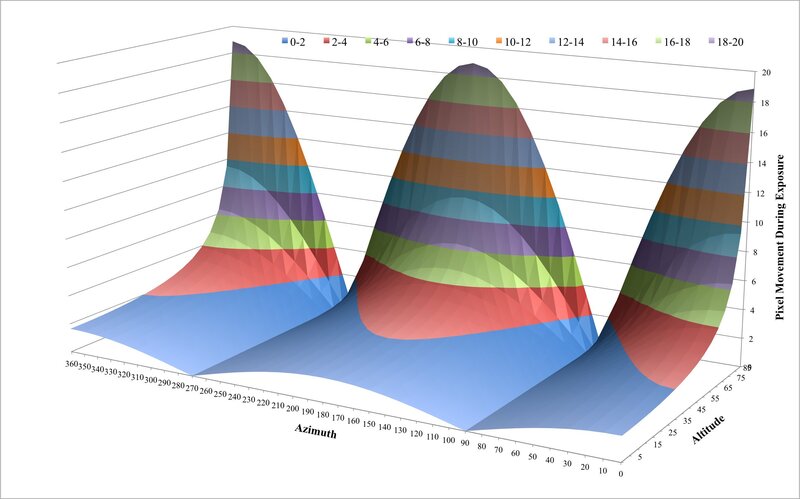 In this post we described depth of focus and derived it mathematically. We then presented an approximation and a model that assumes ideal seeing. The ideal seeing model is routinely used by others and yields good results. Finally, we presented depth of focus figures for various f-numbers and determined that focusing fast optical systems may be problematic. Telescopes can be mounted in a variety of ways. Two common telescope mounts are the altitude-azimuth, or alt-azimuth, and the equatorial mount. The alt-azimuth mount is easier to construct than an equatorial mount, but requires motion on both axes to accurately track celestial objects as they move across the night sky. 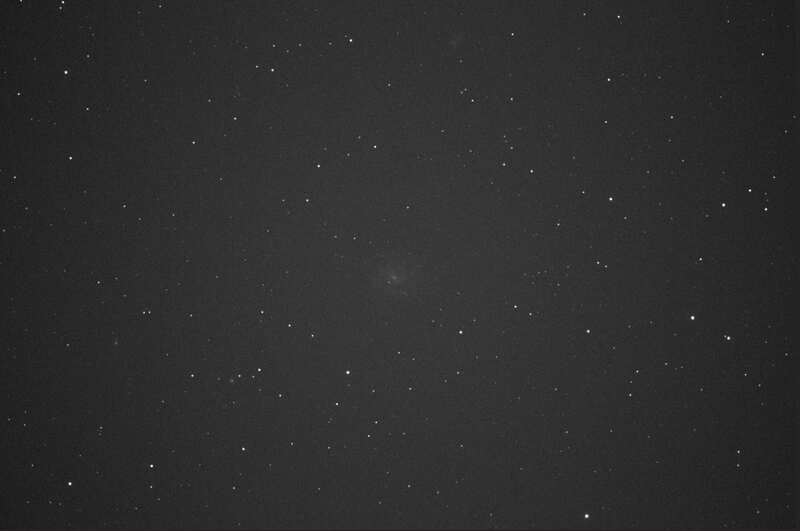 Astrophotography using an alt-azimuth mounted camera system suffers from field rotation, whereas properly aligned equatorial mounted systems do not. The intention of this document is to describe field rotation and determine its impact on astrophotography. In addition, we’ll determine where astrophotography with a CPC 1100 GPS XLT system used in its f/2 configuration can be successful using its alt-azimuth mount. As previously mentioned, the two most common telescope mounts are the alt-azimuth and equatorial mounts. A system utilizing an alt-azimuth mount can benefit from the features of the equatorial mount with the addition of a wedge. This section describes these three mounts and briefly discusses their pros and cons. An alt-azimuth mount often consists of a pair of forks that stand vertically. These forks rotate around the vertical or azimuth axis. The telescope is attached to the forks and can pivot on the horizontal or altitude axis. This system is obviously quite simple to construct and operate, but to track celestial objects, in their apparent circular paths across the sky, requires nearly constant adjustment of both axes. The introduction of microprocessor-based control systems has made this tracking viable. An equatorial mount has two perpendicular axes. The first axis is aligned with the earth’s axis of rotation, right ascension. The second is perpendicular to the first, declination. The telescope is attached to the second axis. To track a celestial object using this mount, the telescope is pointed to the desired object, found at a specific right ascension and declination, and then a constant sidereal clock drives the right ascension axis to compensate for the earth’s rotation. An alt-azimuth fork mount can be configured to benefit from the features of an equatorial mount by aligning the azimuth axis with the earth’s axis of rotation, providing motion in right ascension. The telescope can then swing between the forks in declination. The device used to align the fork’s axis with that of the earth is commonly referred to as a wedge. With the addition of a wedge, the alt-azimuth mount must only be driven in right ascension to track celestial objects. As a constellation rises, crosses the sky on an apparent circular arc and sets, you’ve likely noticed that it appears to rotate. For example, as the constellation Orion rises in the east it may appear to be leaning slightly to the left, at its highest altitude it may be upright and as it sets it appears to be leaning to the right. This is illustrated below. Let’s continue using the Orion constellation as our example. If you’re imaging with a system on an equatorial mount, the telescope and associated camera rotate in right ascension, as illustrated below. The gray rectangles in the figure represent the field of view of the imaging system. The camera retains its relative orientation to the celestial body being photographed. If the equatorial mount is accurately aligned with the earth’s axis, no field rotation occurs. Unlike the previous example, if you’re imaging with a telescope on an alt-azimuth mount you will experience field rotation. In the following illustration, the gray rectangles again represent the field of view of the imaging system. Over time the imaging system remains centered on the middle star of Orion’s belt, but the camera remains level with the horizon due to the orientation of the mount’s two axes of rotation. Notice in the above figure that Orion appears to rotate in the field of view as time passes. If the gray boxes represent distinct times within a long exposure, the stars in the constellation would appear as arcs rotating in a clockwise direction around the center of the frame, in this case, the middle star of Orion’s belt. This is what is meant by field rotation and it is generally undesirable. It should be clear that equatorially mounted systems do not suffer from field rotation issues. However, this is only true if they are well aligned with the earth’s axis of rotation. While alt-azimuth mounted systems typically suffer from field rotation, solutions have been developed that rotate the imaging system to counter the field rotation. While some of these solutions have been available to amateur observers in the past, it doesn’t appear that any commercial solutions are currently available. In addition, software can be used during post processing of images to remove some of the artifacts introduced by field rotation. The above examples illustrate the basic issues related to field rotation and astrophotography. However, field rotation is more complex than first meets the eye. In the northern hemisphere when looking south, like in our example above, the field rotation is in a clockwise direction. Looking north we observe counterclockwise field rotation, and this complexity is just the beginning. In the next section, we’ll investigate the math describing field rotation and present associated graphs. where is the angular velocity of the field rotation in degrees per second, is the angular velocity of the earth’s rotation in degrees per second, is the latitude where the observations are made, and and describe the coordinates of the celestial body of interest, at the time of observation, in degrees. There are a few interesting observations regarding this equation. First, if the observer is at either pole, the will be zero resulting in being zero. This is easily visualized if you imagine standing precisely on either pole and observing the movement of the stars. They will move around you with no change in altitude. This path is easily tracked by rotating around the azimuth axis of an alt-azimuth mount. Second, the field rotation is maximal at the equator where is equal to 1. However, as illustrated in the following figure, the increase in field rotation from latitude 40° north to the equator, for any given azimuth and altitude, is only about 30%. 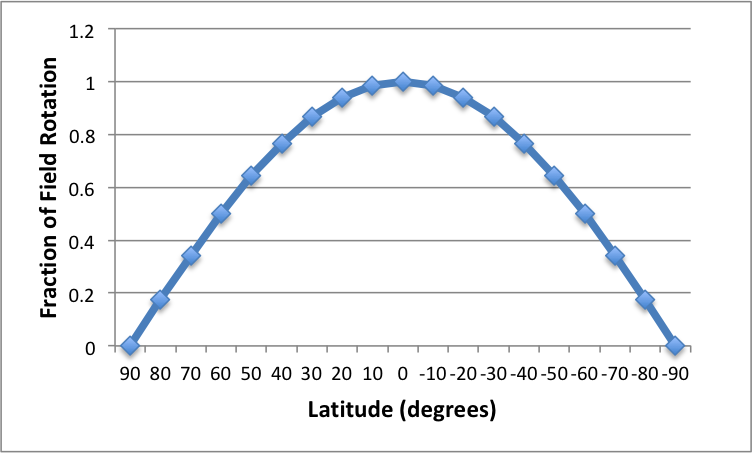 In this figure the horizontal axis is latitude in degrees, where negative values represent latitudes in the souther hemisphere. 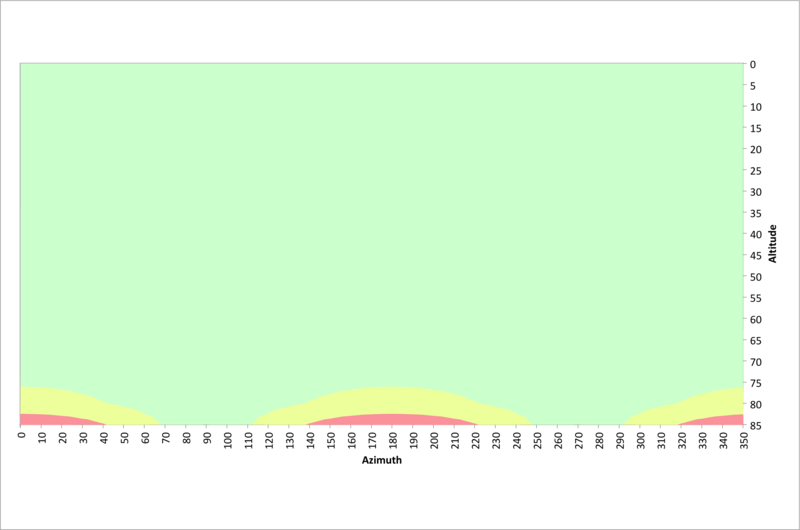 The vertical axis is the value of . Second, if the is zero we have a divide by zero issue. This occurs at an altitude of 90°, the zenith, where field rotation is infinite and cannot be tracked by an alt-azimuth mounted telescope. With regard to the field rotation equation, there are four variables of interest, namely , , and . Four dimensions are difficult to visualize so we’ll use my latitude of 40.3245° north and analyze the other three variables graphically. The vertical axis of the above surface plot illustrates the angular velocity of the field rotation, in degrees per second, for various values of azimuth (horizontal axis) and altitude (depth axis). There are several interesting insights worth pointing out. First, at altitudes less than 65° the field rotation never exceeds 0.01° per second regardless of the azimuth chosen. Second, the field rotation never exceeds 0.01° per second for altitudes up to 75° for azimuths between 240° and 300° and 60° and 120°. In other words, looking due east or due west is far better than looking north or south. Finally, looking north or south results in high rates of rotation. This section has illustrated the mathematical theory governing field rotation. While the math is fairly straightforward, the results are more complicated than one may have initially thought. In the next section, we’ll determine the impact field rotation has on astrophotography for our specific system and reexamine the surface plot above in terms of safe and ill-advised zones for various exposure lengths. For long exposures using imaging systems attached to alt-azimuth or poorly aligned equatorial mounts, field rotation is an issue that degrades image quality. In the previous section, we presented an approach to determine the angular velocity of the field rotation for a given latitude, azimuth and altitude. In this section, we’ll use that information to quantitatively determine how field rotation impacts image quality using systems with various characteristics. 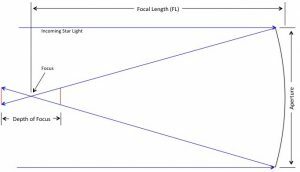 Imaging system characteristics such as focal length, aperture, f-number, exposure length, sensor size and pixel size play important roles in astrophotography. The characteristics that determine the level of impact field rotation has on image quality are focal length, the size of the sensor and the associated pixels. The following figure is a representation of an image sensor made up of a two-dimensional array of pixels. The green, yellow and red disks represent seeing disks projected onto the sensor with angular sizes of 1″, 2″, 3″ and 4″ respectively. This is to scale for a sensor with a pixel size of 4.78µm and a system focal length of 560mm. The sizes of these disks are proportional to the focal length of the system as described below. where is the size of the seeing disk on the sensor in meters, is the angular size of the seeing disk in degrees and is the focal length of the optical system in meters. The four seeing disks illustrated on the sensor are approximately 2.71µm, 5.43µm, 8.14µm and 10.86µm in diameter. While an image is being exposed, the field is rotating at an angular velocity . For a specific exposure time, , the angle of image rotation can be computed as . While all objects in the field of view rotate around the center at the same angular velocity, those furthest from the center cover more distance. To ensure good image quality, the distance travelled must be less than a few pixels on the sensor. In the next section, we’ll try and quantify how much image rotation can be tolerated while still achieving esthetically pleasing results. To determine just how many pixels can be traversed without significant impact, we’ll turn to the rule of 500 used by photographers to image the night sky. It should be noted that this rule was not developed to deal with field rotation, but rather to deal with star movement relative to a stationary camera. However, it does suggest the amount of movement that can be tolerated and still yield pleasing results. This rule of thumb suggests that the maximum length of an exposure, without significant star trails, is computed by dividing 500 by the focal length of the system measured in mm. The angular distance a star image travels across the sensor in this length of time is derived below. where is the angular distance in degrees traveled by a star in measured in seconds given that the earth is rotating at the angular velocity of measured in degrees per second. where is the field of view projected onto the sensor measured in degrees, is the size of the sensor in a particular dimension measured in meters, is the focal length of the system measured in meters, is the number of pixels in the same dimension as mentioned above and is the size of one pixel, measured in meters. where are the number of pixels that can be traversed without leaving significant star trails according to the rule of 500, is the rotational velocity of the earth in degrees per second and is the size of each pixel in meters. A sidereal day is 23 hours 56 minutes and 4.1 seconds or 86,164.1 seconds long. The earth rotates through 360° in this length of time resulting in being approximately equal to 0.00418° per second. For a pixel size of 4.78µm, the rule of 500 suggests that 7.63 pixels can be traversed. We’ll round down to ensure better image quality. For the remainder of this work we’ll assume that if a seeing disk traverses 7 or fewer pixels across the sensor, due to field rotation, the image quality will be acceptable. It is important to keep in mind that the rule of 500 has nothing to do with field rotation. However, photographers have used this rule to achieve good results shooting the night sky without significant star trails in their photographs. If stars traversing 7 pixels in these photographs are not objectionable, they shouldn’t be in our images either. 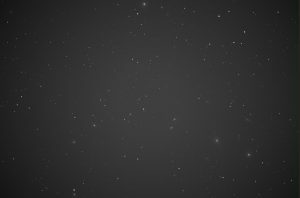 In the previous section we determined that star images traversing 7 or fewer pixels across the sensor would be acceptable. In this section we’ll investigate what impact we can expect due to field rotation and determine where in the night sky it is safe to image without having elongated stars in our photographs. where is the distance an object travels across the sensor in meters, is the distance from the center of the sensor to the object of interest in meters, is the angular velocity of the earth’s rotation in degrees per second, is the latitude where the observations are made, and describe the coordinates of the celestial body of interest in degrees and is the length of the exposure in seconds. Let’s consider the characteristics of a specific CMOS sensor, the IMX071. This sensor is 23.6mm x 15.6mm with a 28.4mm diagonal. The pixel size of this sensor is 4.78µm and they are organized in a two-dimensional array that measures 4944 x 3284 pixels. While objects at the extreme corners of the sensor are not captured as they rotate through the field, their distance from the center is a good worst case measure since they travel further than anything else in the field for any given . If we assume the same of 40.3245° north as before and an exposure time of 10 seconds, we obtain the surface below. The vertical axis is the number of pixels traversed during a 10 second exposure, the other two axes represent the azimuth and altitude of the observed object. For good image quality it is important to have as little movement as possible, but less than 7 pixels according to the rule of 500 discussed in the previous section. The following figure illustrates azimuths and altitudes that result in good 10 second exposures at a latitude of 40.3245° north. The green area illustrates where pixel traversals of 7 pixels or less occur. The yellow areas have pixel traversals of 7 to 14 pixels and the red regions represent pixel traversals greater than 14 pixels. For altitudes less than 75°, acceptable images can be acquired at any azimuth value. Between 70° and 110° azimuth and 250° and 290° azimuth, acceptable images can be obtained at altitudes up to 85°. There are few restrictions for 10 second exposures. Also recall that these values are based on the very corner of the sensor where field rotation has the biggest impact. 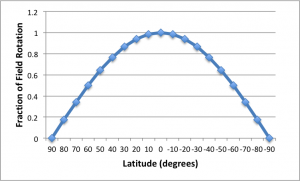 The next two figures illustrate azimuths and altitudes that result in good 20 and 30 second exposures at a latitude of 40.3245° north. Exposure times of 30 seconds result in far more restrictions. The poles should be avoided above 45° and only due east and west are virtually unrestricted. As stated earlier, there is no field rotation at the poles of the earth. The equatorial region suffers the most field rotation. 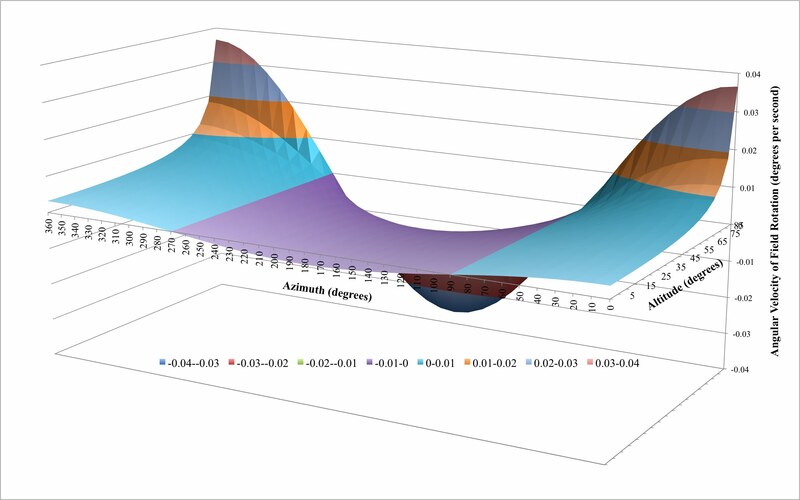 The following figure illustrates azimuths and altitudes that result in good 10 second exposures at the equator, latitude 0°. As previously stated, moving from a latitude of ~40° to 0° has little impact on the effects of field rotation. There are no restrictions below 70° of altitude and almost no restrictions in the vicinity of due east and due west. In this section we discussed and visualized the impact of field rotation on astrophotography and discussed where in the sky it is acceptable to image. In the next section we’ll discuss these results as they apply to a specific use case. In the previous sections we have described field rotation and determined its impact on astrophotography in terms of azimuth, altitude, latitude and exposure time. In addition, we have hypothesized, using the rule of 500, that star images can cross 7 or fewer pixels on the image sensor without significantly degrading image quality. In this section, we’ll investigate how this impacts images captured using a Celestron CPC 1100 GPS XLT telescope on an alt-azimuth mount. Finally, we’ll determine under what circumstances this configuration can successfully capture images of deep space objects (DSO). The system of interest is a Celestron CPC 1100 Schmidt-Cassegrain telescope mounted in its standard alt-azimuth mount. The system includes a Hyperstar 3 lens system and a ZWO ASI071MC Pro camera. The Hyperstar system replaces the secondary mirror of the telescope and results in an optically fast f/2 system with a focal length of 560mm. The ZWO ASI071MC Pro camera uses the IMX071 sensor that measures 23.6mm x 15.6mm with a 28.4mm diagonal. The pixel size of this sensor is 4.78µm and they are organized in a two-dimensional array that measures 4944 x 3284 pixels. An f/2 optical system is quite fast, which allows shorter exposure times than used by astrophotographers using more traditional f5.6 or slower refractor telescope systems. In fact, an f/2 system is 8 times faster than an f/5.6 system. While there is much debate around the optimal exposure time of sub-exposures used in stacking, there are many who use 2 to 5 minute sub-exposure times with f/5.6 systems. Compared to an f/5.6 system, an f/2 system can collect the equivalent amount of light in 15 to 37.5 seconds. Given my latitude of 40.3245° north, our use of the rule of 500 and the above information we can once again refer to the following figure. Again, the green area of this figure is where the field rotation results in fewer than 7 pixels being traversed at the corner of the sensor during a 30 second exposure. The yellow and red regions violate the rule of 500 for this long of an exposure. On our f/2 system a 30 second exposure is equivalent to a 4 minute exposure on an f/5.6 system. This should be satisfactory for sub-exposure times for many DSOs. 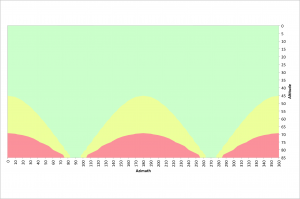 The green area in the above figure represents azimuths and altitudes where we can expect good results. We should have good results anywhere below an altitude of 45°. Since seeing is generally not ideal below an altitude of 30°, we should expect to find success at any azimuth between an altitude of 30° and 45°. We can also find success at azimuths from 55° to 125° and 235° to 305° for altitudes up to 65°. Due east and west we have virtually no limitations. While the exposure times discussed above result in acceptable field rotation within a give sub-exposure, there will be significant field rotation over the set of sub-exposures that will be stacked during post processing. Removing this field rotation requires the stacking algorithm to align stars using both translation and rotation. Nebulosity 4 can perform star alignment using translation, rotation and scaling. I’m confident other tools can as well. Alt-azimuth mounted telescopes used for astrophotography suffer from field rotation. Field rotation causes star images on the sensor to circle around the center of the field of view. To achieve acceptable results the amount of movement must be minimized. The rule of 500 suggests that if 7 or fewer pixels are traversed during an exposure, the outcome in terms of star trails will be acceptable. For 10 second exposures, there are few limitations on where in the sky an object can be photographed. As the exposure times increase to 30 seconds far more restrictions exist, but success can be found. Several obvious things can be done to improve the likelihood of acquiring acceptable results. First, imaging where field rotation will result in 7 or fewer pixel traversals will help. 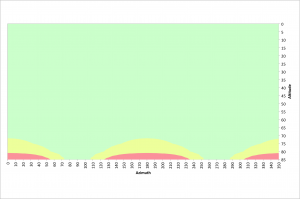 These areas are identified in the previous graphs. Second, the shorter the exposure times the better. While 30 second exposures have a few unacceptable areas of the sky, 10 second exposures have virtually no limitations. Finally, since field rotation issues decrease as you move towards the center of the sensor, cropping acquired images will help. For our Celestron CPC 1100 GPS XLT at ~40° north latitude operating in an f/2 configuration, there are few limitations when taking 10 second exposures. Since f/2 is 8 times faster than a typical f/5.6 refractor telescope used for astrophotography, 30 second exposures, or even shorter, will likely result in acceptable sub-exposures. Now it is time to collect data and see how accurate these findings are. There are numerous issues to consider when choosing a camera for astrophotography. Consideration must be given to the type of astrophotography of interest, the specifications of the chosen telescope, and the camera style, technology and sensor specifications. This document addresses these issues in general terms and illustrates specifics based on an example telescope, a Celestron CPC 1100 GPS XLT. The two types of astrophotography investigated in this document are planetary imaging and deep space object (DSO) photography. Planets and DSOs have unique characteristics that demand different approaches for capturing aesthetically pleasing images. The two characteristics that most influence the employed methodologies are apparent size and brightness. The apparent size of celestial objects are measured in arc-seconds. The celestial sphere, like a circle, has an angular circumference of 360°, read as 360 degrees. Each degree can be subdivided into 60’, read as 60 arc-minutes, and each arc-minute can be subdivided into 60”, read as 60 arc-seconds. For reference the apparent size of our sun and moon are approximately 32’ or 1920”. The planets range in apparent size from Neptune at 2.21” up to Jupiter at 40.95”. In comparison DSOs in the Messier Catalog range in apparent size from M40 at 48” up to M31 at 10,680” or 178’. The apparent brightness of celestial objects are measured in magnitude (m) as observed from earth. The brightness of an object can be measured in various wavelengths of the electromagnetic spectrum. We’ll restrict our interest to the visible spectrum where magnitudes are denoted mv. Brighter objects have lower magnitudes, it’s an inverse relationship. The brightest object in the sky is the sun at magnitude -27 or mv = -27. The magnitude scale is logarithmic. A difference in magnitude of 1 is equivalent to a change in brightness by a factor of or approximately 2.512. The magnitudes of the planets range from Neptune at mv = 7.96 up to that of Venus at mv = -3.86. However, the most imaged planets range in brightness from Mars at mv = 0.56 up to Venus at mv = -3.86. In comparison the DSOs in the Messier Catalog range in magnitude from M91 at mv = 10.2 up to M45 at mv = 1.6. However the second brightest item in the Messier Catalog is M7 at mv = 3.3, illustrating that M45 is a bright exception. With regard to astrophotography, the planets are very small and relatively bright objects, while DSOs are huge in comparison and very dim. These differences lead to different imaging strategies which in turn influence equipment configuration and technology choices. There are many types and sizes of telescopes. This document will not attempt to describe the various types or their strengths and weaknesses. Instead, it will cover basic configuration parameters that impact the imaging of planets and DSOs. From the previous discussion it should be clear that a large field of view is important for imaging DSOs and high magnification is essential for photographing the planets. These are competing requirements in terms of telescope specifications. The aperture of a telescope is the width of the primary mirror or lens. Larger apertures are capable of resolving finer detail and collecting more light, resulting in lower exposure times. The focal length is the distance from the primary mirror or lens to where the image is focused. Longer focal lengths result in more magnification and narrower fields of view. The f-number, or speed of the telescope, is determined by dividing the focal length by the aperture. For a given aperture, planetary imaging demands a large f-number where high magnification is obtained. For imaging DSOs a low f-number yields less magnification and a greater field of view. Astrophotographers acquire telescopes with as much aperture as they can afford and physically handle. Those photographing DSOs tend to acquire moderately sized apochromatic (APO) refractor based telescopes with f-numbers in the f/5.6 to f/7 range. They often add a focal reducer to further decrease the effective f-number. Those photographing planets tend to acquire telescopes with longer focal lengths and employ Barlow lenses to increase the focal length by a factor of 2, 3 and even 5. Telescopes like the Celestron CPC 1100 GPS XLT have a large 280mm aperture. The Schmidt-Cassegrain telescope (SCT) design results in a focal length of 2800mm and an f-number of f/10. This configuration results in a narrow field of view and relatively long exposure times for faint DSOs. The addition of a Barlow lens to this configuration results in a system that is ideal for planetary imaging. 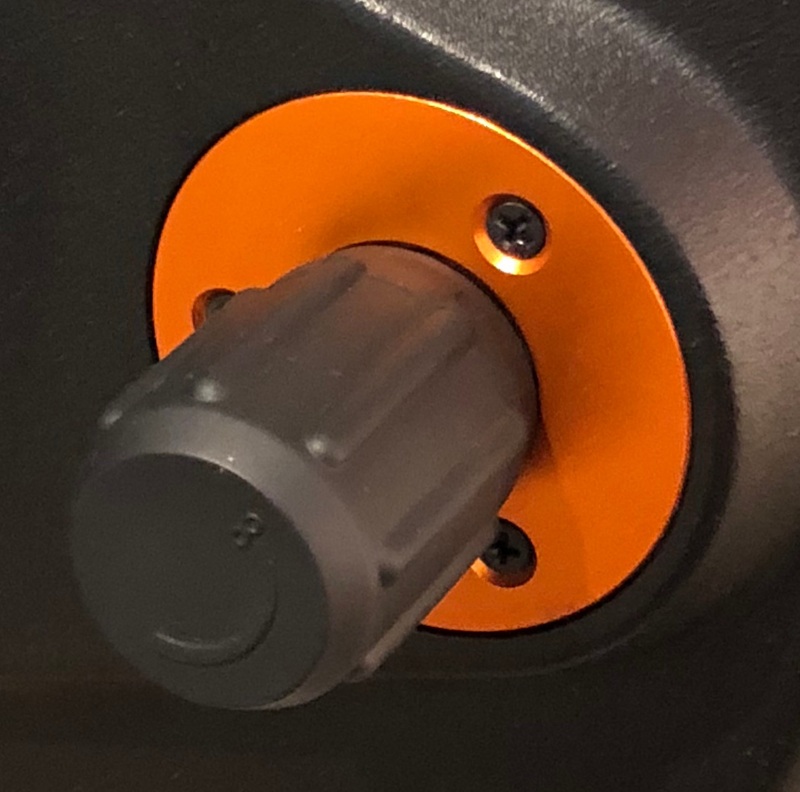 Fortunately, Celestron included a removable secondary mirror to the CPC 1100 system that can be replaced by a lens system called Fastar or Hyperstar. These systems convert the telescope from a relatively slow f/10 system to a fast f/2 imaging system. In this configuration the CPC 1100 has a focal length of 560mm and a huge field of view of just over 2.76°. This convertible feature makes the CPC 1100 useful for both planetary and DSO imaging. There are many choices to be made when selecting a camera for astrophotography. These choices include the camera form factor, the sensor technology and detailed specifications such as sensor size, pixel depth and pixel size. While there are commercially available cameras specifically deigned for astrophotography, many photographers use modified DSLR cameras. The beneficial modification entails removing the infrared filter that sits permanently over the sensor of the camera. This renders the camera less than useful for regular photography, but allows the camera to be more sensitive to the wavelength of light produced by Hydrogen-alpha emission nebulae. These cameras may be used with nearly any telescope, but when placed in front of the optical path, using a system like Fastar or Hyperstar, the size and shape of the camera may block an unacceptable amount of light and introduce diffraction artifacts in captured images. Many dedicated astrophotography cameras have better form factors that permit them to be connected within the optical path without negatively impacting the amount of light entering the system. In addition, many of these cameras are cooled, reducing sensor noise and increasing the quality of the finished results. However, these cameras have connected cables that introduce unwanted diffraction patterns in images. Commercially available astrophotography cameras are available with CCD and CMOS sensors. CCD sensors have an edge over CMOS sensors in image quality, but CCD sensors have slower read speeds. High read speeds increase the frames per second (fps) that can be acquired by a camera. High frame rates are particularly important in planetary photography using lucky imaging techniques. This methodology requires many frames per second be taken in the hope of collecting images, or portions of images, less distorted by atmospheric turbulence. CMOS sensors are better suited for this technique. For DSO photography the read speed is less important, but can reduce the overall session time. The near infrared portion of the spectrum is important in DSO photography and CCD sensors are more sensitive than CMOS sensors in this area. However, CMOS sensors, found in modified DSLR and commercially available astrophotography cameras, are adequate in this area and cost far less for the same pixel count. The remainder of this document will focus on CMOS sensor based technologies. To determine necessary camera specifications it is important to understand what is trying to be imaged. The next sections will describe the imaging of stars and how this impacts camera sensor specifications. Stars are far enough away and small enough in comparison to their distances from earth to be considered points of light. Ideally, these points of lights should be focused to points within an optical system, but due to diffraction and atmospheric turbulence they are not. Due to diffraction, the smallest point to which a mirror or lens can focus a point source of light is the size of what is known as an Airy disk. The Airy pattern, named after George Biddell Airy, has a bright central region, the Airy disk, surrounded by concentric bright rings. A graphical representation of an Airy pattern is shown to the right. As a mirror or lens focuses a star, it will appear as an Airy pattern to the observer. 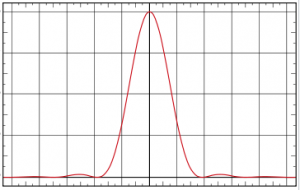 In this case the vertical axis represents the intensity of the observed star light and the horizontal axis is a measure of the dimeter of the Airy pattern. where is the radius of the Airy disk in radians, is the wavelength of light in meters and is the diameter of the mirror or lens in meters. Our example telescope (a Celestron CPC 1100 SCT) is diffraction limited and has an aperture of 280mm. In ideal conditions this optical system would produce an Airy disk with a diameter of 0.97” for visible light with a wavelength of 540nm. So an ideal 280mm diffraction limited telescope, without an atmosphere between it and the observed star, would produce an Airy disk with a diameter of 0.97”. Our atmosphere distorts star light traveling through it. These distortions often occur more than 100 times per second. For long photographic exposures (greater than a few seconds) this movement of the Airy disk results in a larger disk know as a point spread function or seeing disk. This disk is similar in shape to the Airy disk, actually a two-dimensional normal distribution, and its width, generally defined as the full width at half maximum (FWHM), is a measure of the seeing conditions. The best seeing from high altitude mountain observatories is reported to be approximately 0.4”. Most observers seem extremely content with FWHM of 1”, happy with FWHM of 2” and 3” and stop work above 4”. In the next section we’ll use a FWHM equivalent to the diameter of the Airy disk to determine the sensor requirements to accurately represent images captured during perfect observing conditions. If seeing is worse than ideal, the chosen sensor characteristics will be more than adequate. CMOS sensors are available in a range of sizes with each containing a different number of light collecting elements or pixels. 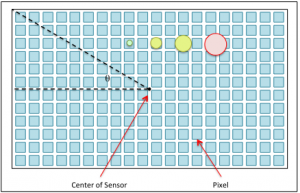 The size of the sensor and the number of pixels determine the pixel size. 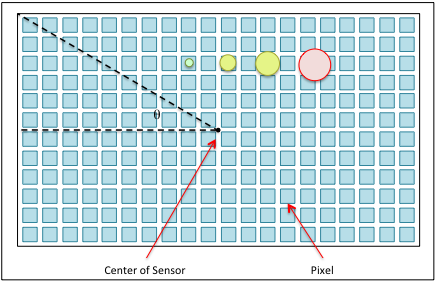 Sensor size is important because it influences the field of view (FOV) of collected images. Pixel size is important to ensure that the light from each star strikes enough pixels to be sampled properly. The field of view of a telescope and sensor combination is described by the following equation. where is the size of the sensor in one dimension measured in meters, is the number of pixels in the same dimension and is the focal length of the optical system in meters. The ratio of to is simply the pixel size, . Nyquist sampling indicates that we need at least two samples of the seeing disk, or the Airy disk in our ideal case, to accurately represent it. Two samples is what is required of one-dimensional signals like audio, but for a two-dimensional system, like the one at hand, it is more like 3.3. In other words, should be 1/2 to 1/3 the diameter of the Airy disk. We’ll use 1/2 for the remainder of this work which is equal to the Airy disk’s radius. For an f/2 optical system at 540nm, the ideal pixel size is 1.32µm while the same system operating at f/10 would have an ideal pixel size of 6.59µm. It is unlikely the seeing conditions will ever approach the ideal and will more likely result in FWHM values of between 2” and 4”. At these values the ideal pixel sizes for an f/2 system would be 2.72µm and 5.44µm respectively. For an f/10 system they would be 13.59µm and 27.22µm respectively. Three commercially available CMOS sensors include the MN34230, IMX294, and the IMX071. These sensors have pixel sizes of 3.8µm, 4.63µm and 4.78µm respectively. These sensor pixels are not quite small enough to offer the ideal sampling at f/2 with good seeing, are satisfactory for imaging in poorer conditions and are more than adequate for imaging at higher f-numbers. In addition, beautiful images can be obtained without reaching these sampling goals, which are often less important for aesthetically pleasing pictures than a large field of view. With a focal length of 560mm these sensors yield fields of view of 1.81°, 1.95° and 2.41° respectively. Each pixel of a CMOS sensor can only collect so much light energy before it reaches its maximum value or saturation. This point is called full well capacity. When a pixel value is read, it returns the measured intensity of light that struck the pixel and a small error. This read error (and dark current noise) subtracted from the full well capacity represents the dynamic range of the pixel and associated sensor. We’re assuming here that for cooled astrophotography cameras the dark current impact is negligible. This may not be the case, but for comparison purposes it is a reasonable approximation. High dynamic range is a desirable feature. When light strikes a pixel in a CMOS sensor it generates a voltage. This voltage is sampled by an analog to digital converter that translates the voltage into a binary number. The set of binary numbers representing all pixels on the sensor represent the collected image. The number of bits representing each pixel defines how well subtle tonal changes in a scene will be preserved. More bits representing each pixel will result in a final image that is a better representation of the original scene. Typical sensors use 8-14 bits to represent each pixel. Typically the larger a sensor is in terms of the number of pixels, the slower the read speed. Some sensors permit partitioning allowing portions of the sensor to be read, increasing speed. Read speed is related to frames per second that can be captured. 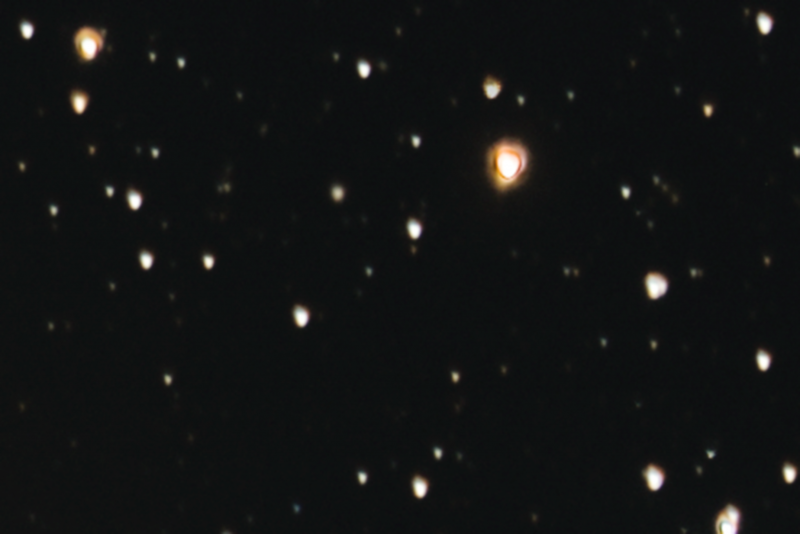 Planetary imaging using lucky imaging techniques require many frames per second. Typical large CMOS sensors have full sensor read speeds between 10 and 30 frames per second. Reduced resolution reads can be done much faster. While there are many commercially available astrophotography cameras from numerous vendors, this document will illustrate just a few. The following table illustrates the specifications for cameras based on the MN34230, IMX294, and IMX071 CMOS sensors. Two of the cameras are based on the same sensor, but have slightly different specifications. In the next section we’ll consider which characteristic of each camera is a best match for our application. FOV per Pixel @ 560mm FL 1.4" 1.69" 1.75" 1.75"
In this section we’ll consider each CMOS camera illustrated in the previous table and how it fits our application. We desire a camera that will be useful for DSO imaging in conjunction with a Fastar or Hyperstar system connected to a CPC 1100 GPS XLT telescope. We would also like to use the same camera for planetary imaging connected to the same telescope in its f/10 configuration augmented with Barlow lenses to increase the f-number to f/20 or f/30. Each of the four cameras are cylindrical in shape with diameters that are less than the diameter of the secondary mirror of the Celestron CPC 1100 telescope. In other words, none of the cameras obstruct the useful aperture and all have the same cabling, causing unwanted diffraction. These cameras will also connect fine in the f/10 configuration. In the f/2 configuration, with perfect seeing, we could use a pixel size of 1.32µm, but with realistic expectations of FWHM of 3”, Nyquist requires a pixel size of 4.08µm. Only the ASI1600MC Pro has a pixel size that meets this requirement. In the f/10 configuration, all of the cameras meet Nyquist’s requirement. In fact, the large pixel size of the two cameras using the IMX071 sensor would meet the sampling requirement down to f/7, using a focal reducer, with perfect conditions, and lower under realistic seeing. 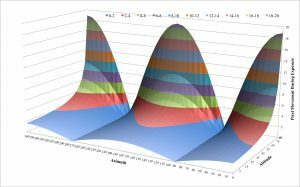 The larger pixels of the ASI294MC Pro, ASI071MC Pro and the QHY168C result in higher full well capacities that in turn result in potentially better dynamic range. This is particularly important when operating at f/2 when bright stars within the large field of view may quickly saturate some pixels. In addition, these three cameras also have 14 bit ADCs that may result in slightly more accurate images. The four cameras range in speed from a low of 10 fps to a high of 23 fps. However, each is capable of higher speeds at lower resolutions. For example, the QHY168C is capable of frame rates as high as 130 fps for 240 lines of resolution and 30 fps for 1920 x 1080 HD. These rates should be adequate for useful planetary imaging in good seeing conditions. In this section we’ll refer to data in the above table and point out meaningful characteristics that are best met by the associated camera. The camera with the best pixel size that approaches proper sampling is the ASI1600MC Pro. However, none of the cameras have small enough pixels to meet the demands of Nyquist’s sampling requirements for ideal seeing conditions. As previously stated, beautiful images can be obtained without reaching the Nyquist sampling goals and these goals are often less important than obtaining a large field of view. Since the field of view is directly related to the sensor size, the ASI071MC Pro and the QHY168C are the big winners. Their fields of view are nearly 1/2° wider than the next best camera. In addition, these two cameras have better dynamic range and have the same size ADCs. In comparing the ASI071MC Pro and the QHY168C, the ASI071MC Pro has a larger memory buffer made of DDRIII instead of DDRII memory. It also achieves a slightly cooler temperature which should further increase its dynamic range beyond that of the QHY168C. The ASI071MC Pro includes a 2-port USB 2.0 hub, is 60g lighter and insignificantly smaller. Finally, the QHY168C is currently $181 less expensive than the ASI071MC Pro. The following table illustrates the components that are necessary to use the Celestron CPC 1100 GPS XLT telescope for astrophotography. Note that the additional $181 for the ASI071MC Pro adds only 5% to the total cost of the project. This seems reasonable given the slight feature advantages it has over its competitor. 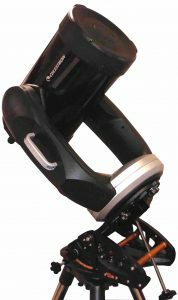 The convertible feature of the Celestron CPC 1100 GPS XLT telescope makes the system useful for imaging planets in its f/10 configuration, while its f/2 configuration, using Fastar or Hyperstar, yields a massive 2.7° field of view for imaging DSOs. While none of the reviewed cameras have small enough pixels to satisfy Nyquist sampling requirements for theoretical seeing conditions in the f/2 configuration, two of the four are adequate and yield 2.4° fields of view. For planetary imaging these two cameras easily meet the sampling requirements and have fast enough frame rates to support lucky imaging techniques. While the cost of the ASI071MC Pro is slightly higher than the QHY168C, the ASI071MC Pro reaches cooler temperatures, has a USB hub that may reduce wiring congestion, is 60g lighter and is slightly smaller. Overall, the ASI071MC Pro is our best fit.